A critical element of a child’s development is to use the muscle of the mind. It is simple for any child to incorporate regular household items to imagine they are on the moon or playing with a dinosaur. It has nothing to do with the shape or texture of the item, but everything to do with a child exploring his or her imagination. "Imaginative play fosters creativity and helps children explore the world," says child psychologist David Elkind, Ph.D., author of The Power of Play. Dr. Elkind says that playing make-believe has a therapeutic effect on a child. "Children sometimes feel weak in comparison to adults, but when they engage in it they take the role of adults and heroes." 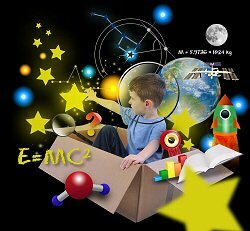 Here are a few great ways parents can encourage kids to immerse themselves in the greatest universe they know, their minds, using some common household items. Any parent who has ever spent a fortune on gifts only to have the child play with the box knows this is a winner. Find a local appliance store and get your kids an old refrigerator or washer/dryer box. Let them cut out holes for windows, or decorate with colorful paper or paint. Smaller boxes can be used to create walls and tunnels or task them with building a “secret fort” entirely out of those boxes stacked up in the garage. Building toys, such as Lego or Bloco, allow kids to create creatures of all shapes and sizes. If they can imagine it, they can build it. These types of educational toys encourage a child to create a world as far as their mind’s muscle can take them. Remember when we used to make those handprints when we were in elementary school and proudly gave them to our parents when we returned home later that day? Well, Plaster of Paris is inexpensive and will keep kids busy and excited all day. A child can create almost anything they can think of from a volcano to a flower vase. You can purchase Plaster of Paris from any craft store or use a common homemade recipe of 2 parts diluted white glue to 1 part warm water. It’s art + science which combines for some serious play time. Let your child’s mind run wild with imagination and watch the inventions begin!